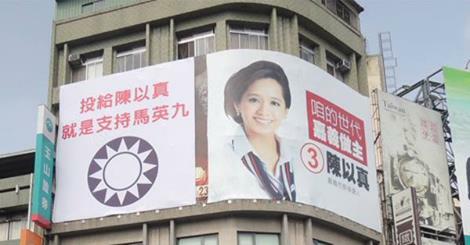 As election day nears, it looks like the KMT will do miserably in Taipei City. 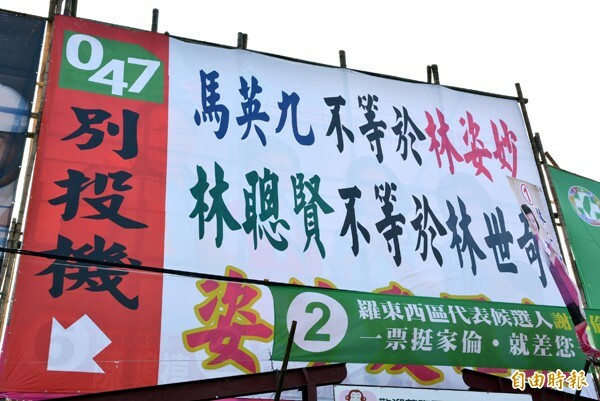 Even if Sean Lien 連勝文 somehow manages, against all polls and all expert prognostications, to win, nearly everyone expects him to do worse than any previous KMT candidate in Taipei who has had the blue side of the political spectrum all to himself. Once the results are in, the next question to ask is, what does it mean? 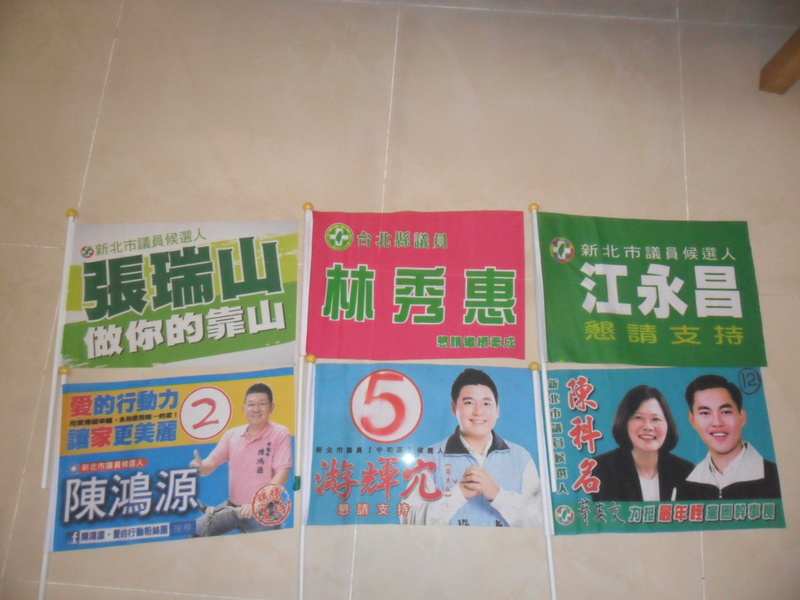 The ways that people are encouraging us to understand this election and its implications seem to depend primarily on whether they think this election is mostly about Ko 柯文哲 and his campaign or mostly about Lien and his campaign. 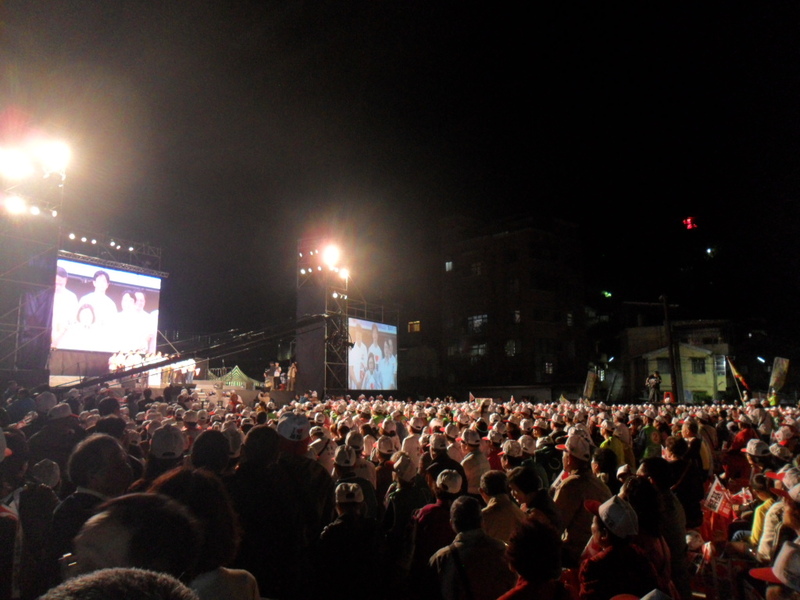 On one side, there are people who focus on the Ko camp. The things that they tend to look at are the inclusive nature of his appeals and Ko’s incorporation of the Sunflower student movement’s ideals and energy. 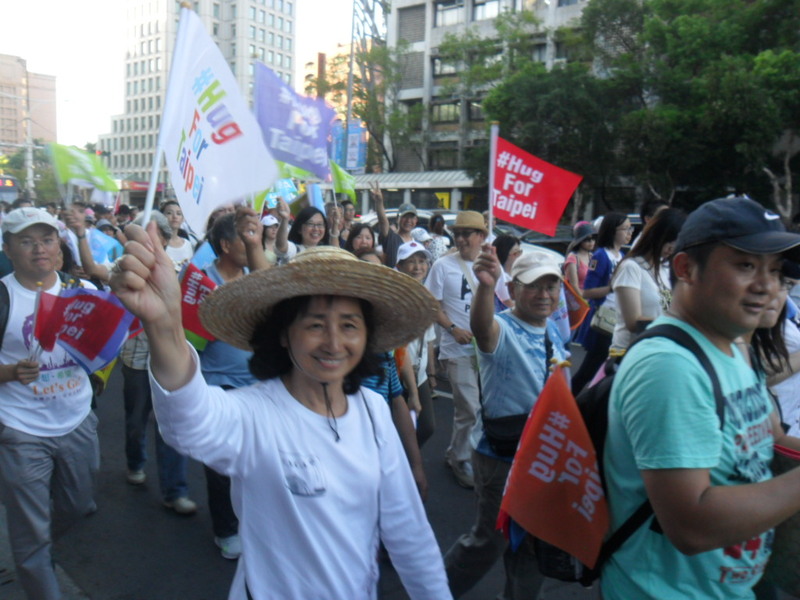 In this discourse, Ko’s campaign is creating something new in Taiwanese politics by transcending the old blue and green cleavage lines and building a genuine bottom-up approach to solving political problems. Ko is also explicitly rejecting politics for the privileged few, especially the business elites who deal with China. 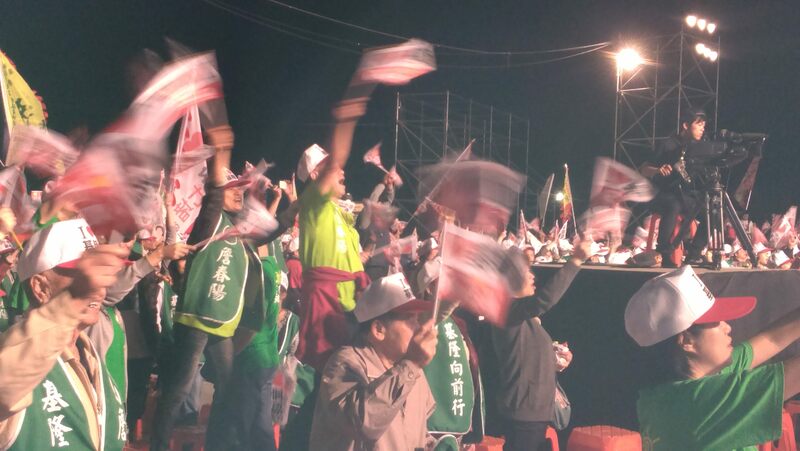 This new force has the potential to transform the current party system and radically reshape all Taiwanese politics. I think these two articles are good statements of the vision of this first discourse. On the other side, there are people who think that the Taipei race is almost entirely about the failings of the Lien campaign. I am firmly in this camp. If you buy this argument, the implications of the current election are far less reaching. 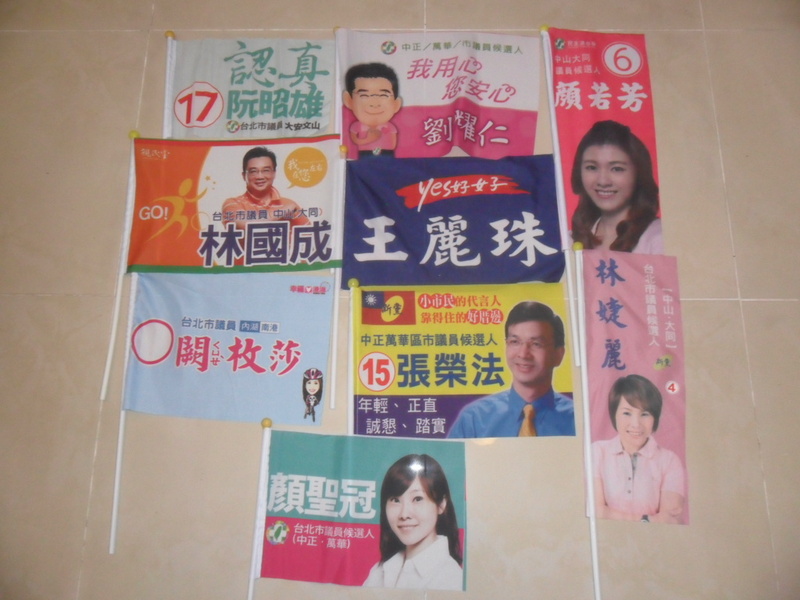 The primary lesson is that the KMT can’t afford to nominate terrible candidates, even in its strongest districts. 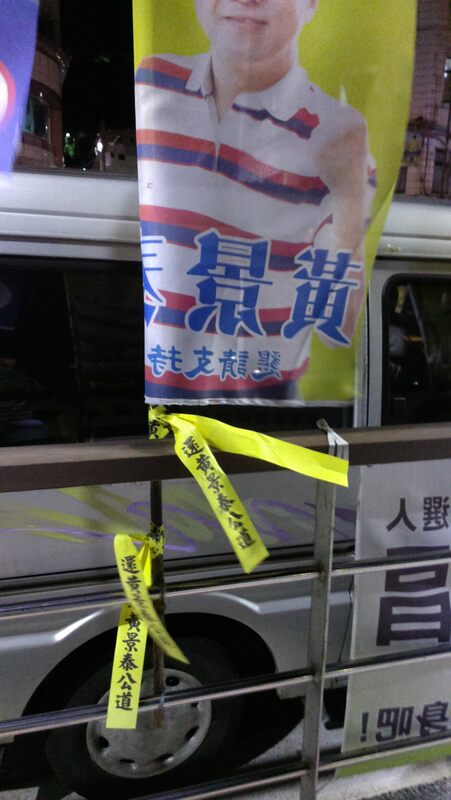 This bodes well for Eric Chu 朱立倫, who is widely seen as the KMT’s most appealing choice in 2016. 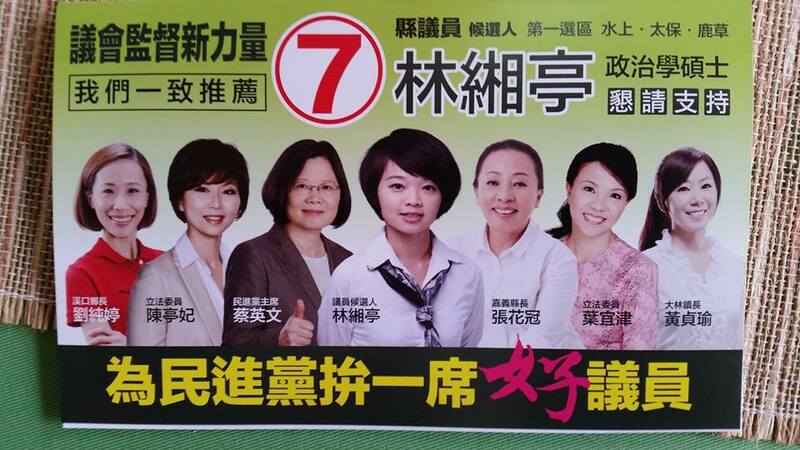 Why do I think this election is mostly about Lien? If a voter who has always voted for a particular party suddenly changes her behavior, there are two common stories. First, something fundamental could have caused the voter to reassess her values or the implications of those values and led her to conclude that she should change sides. If large numbers of voters all do this at the same time and in the same direction, the party system can be fundamentally revamped in a “critical election.” However, critical elections are rare. The American scholars who developed the idea thought that the USA had had critical elections in 1868, 1896, and 1932, following the US Civil War, the Panic of 1893 (and associated economic dislocations all over rural America), and the Great Depression. In other words, it takes a cataclysmic, once-in-a-generation event to produce a critical election. 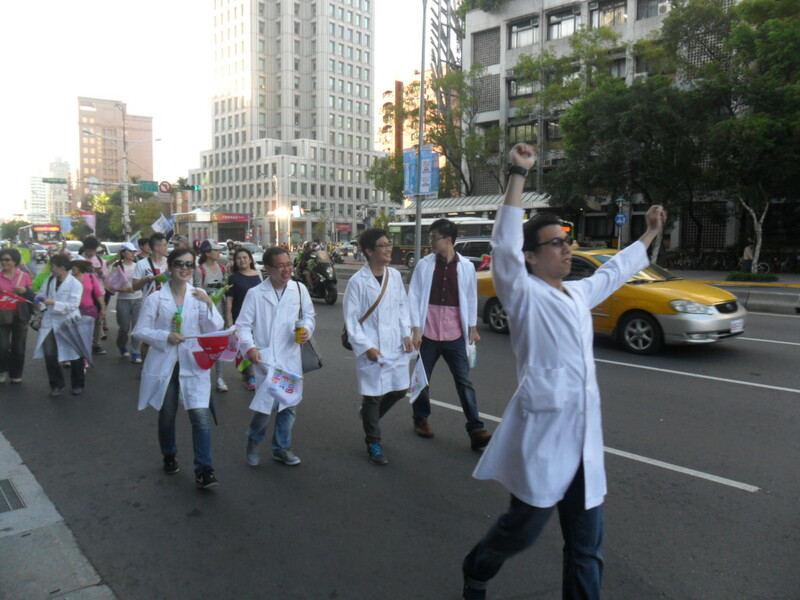 The Sunflower protests undoubtedly shook Taiwan, but did they rock it to its very core? The second possibility is less demanding. In a “deviating election,” voters don’t fundamentally change their underlying values or preferences, but they vote against their normal pattern based (usually) on the characteristics of the specific candidates on the ballot. I think this is what we are seeing. Many voters who have always voted blue are looking at Sean Lien and finding him personally inadequate as a potential mayor. We are starting to see a number of stories about just how terrible Lien has been. The best one I have seen is from Julian Kuo 郭正亮, who is one of the most perceptive minds in the DPP. In this article, Kuo paints Lien as unprepared to be mayor. Lien has complained that Ko and the media won’t focus on his policy proposals, but Kuo points out several specific examples of how Lien’s policy proposals were poorly thought out and hastily discarded once the inevitable objections were raised. The media hasn’t taken Lien’s policies seriously because they were not serious proposals. 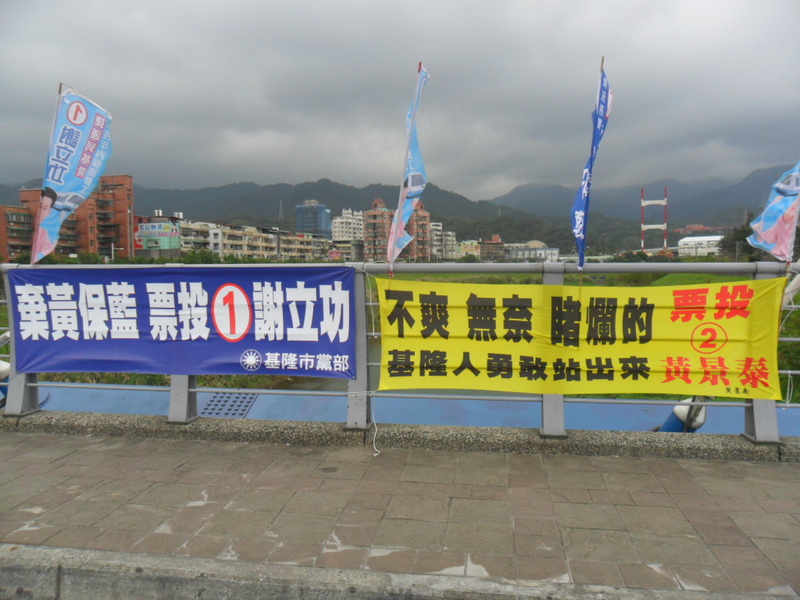 Similarly, Lien hasn’t been sufficiently prepared for basic campaign events, and so he has talked to people using liquid gas in tanks about problems associated with piped natural gas and made basic gaffes such as not knowing the number of neighborhoods 里in Taipei City. One of the things that many commentators miss is how hard you have to prepare to run for office. 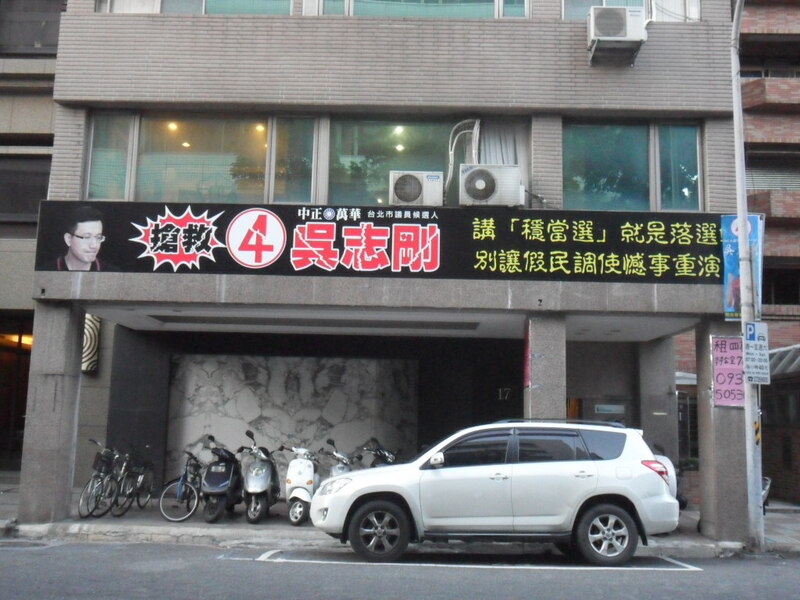 You can’t just drop in, look pretty, and expect to win an election, as this idiotic column suggests “princess” Chen Yi-chen 陳以真 is doing in Chiayi City. You have to have thought about what you want to do, studied the concrete problems facing the electorate, listened to different experts explain why different proposals will or will not work, considered how different constituencies will react to each proposal, and so on. In other words, you need a year or two of intensive preparation in order to run for office. We tend to overlook this because all the serious candidates do their homework. If they don’t, it filters out into the electorate. Media treats them with less respect, party workers privately express disgust to people they know, the opposition camp gleefully repeats stories of the candidate’s ineptitude, and voters learn, often indirectly, that the candidate is simply not ready to hold office. 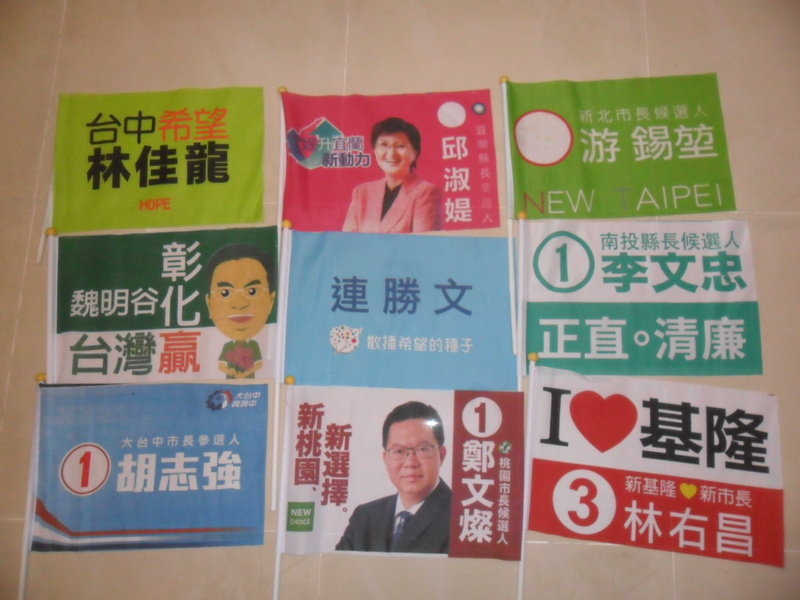 If Sean Lien had been adequately prepared for this race, I suspect that Taipei would have turned out much like the current Taoyuan race. 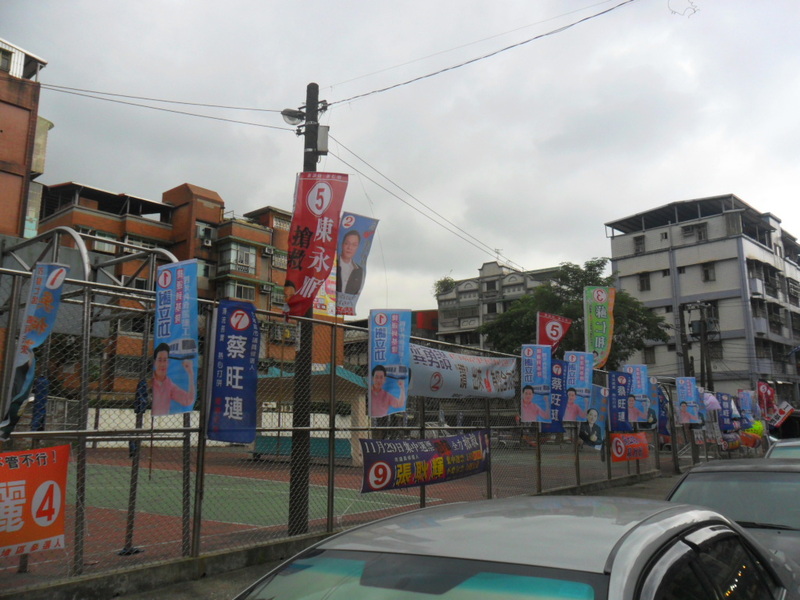 In Taoyuan, another district with a predominance of voters who generally vote blue, John Wu 吳志揚 faces many of the same complaints about inheriting his status as Lien. However, after stints in the legislature and a term as county chief, Wu can convincingly talk about the details of governing Taoyuan. For most blue voters, Wu is sufficiently competent and they can therefore vote for him. To be sure, national-level factors such as President Ma’s unpopularity will eat away at the normal KMT margin of victory. 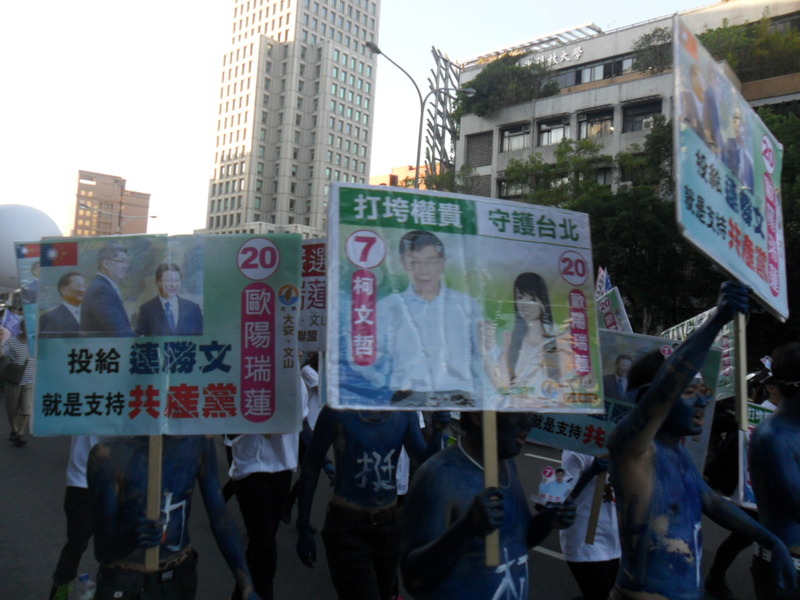 However, the blue coalition is not imploding in Taoyuan the way it is in Taipei. Faced with a more prepared Lien, Ko’s camp might have made the same inclusive and bottom-up appeals, but I doubt they would have had much effect. 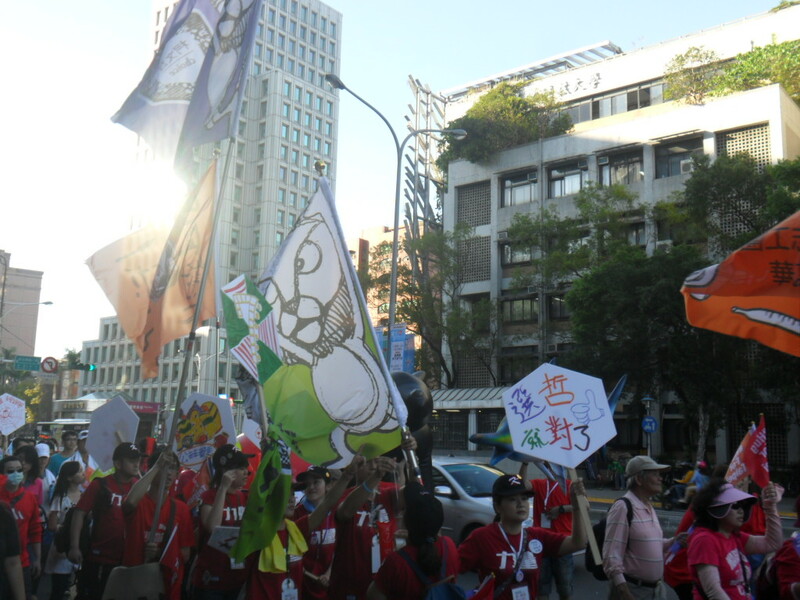 This afternoon, the Ko campaign held a big parade in Taipei City. Again, I am a terrible photographer and I have a lousy camera, so don’t expect too much from these pictures. 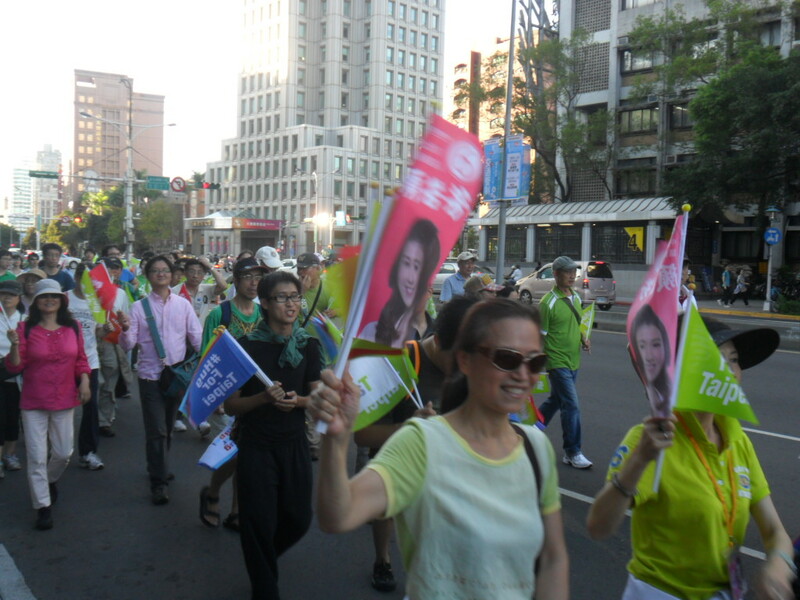 After yesterday’s disaster, I tried to stay steady and these pictures are less blurry than those from the Lien march. The crowd gathers at the CKS memorial. This photo covers about 1/3 of the total crowd. 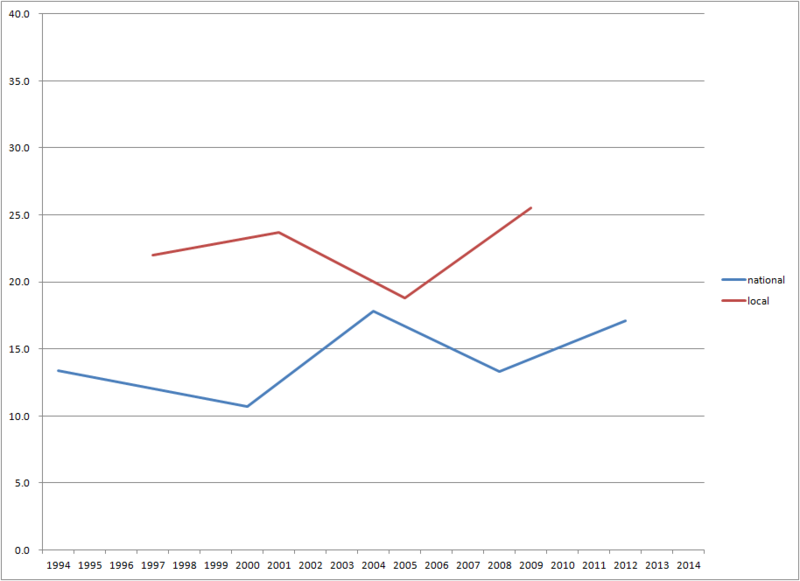 Since everyone wants to know, I’d say that the numbers of people in the Ko and Lien parades were fairly close. Both parades took over an hour to walk past a given spot, though the Ko parade may have been a bit more densely packed. 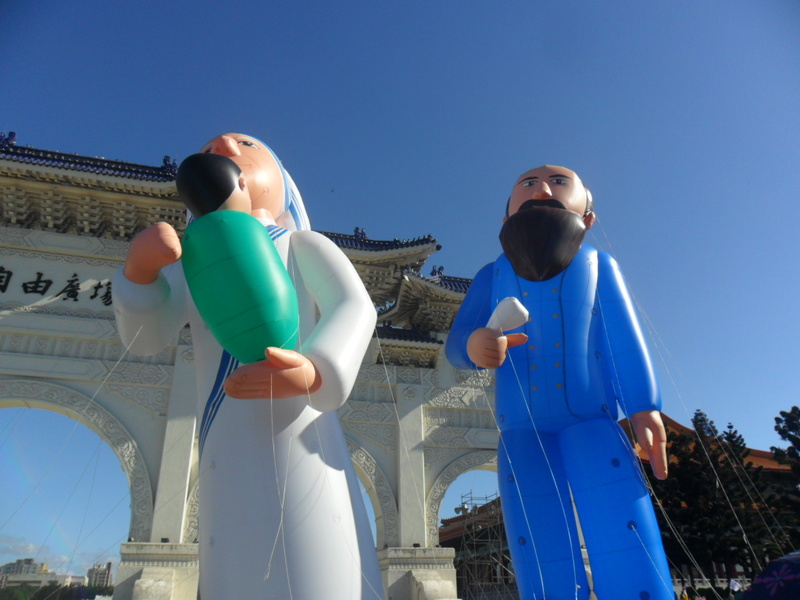 The Lien parade claimed 80,000 people, while the Ko parade (inevitably) topped that with an announcement that 200,000 had joined. It is much harder to estimate a parade than a stationary crowd (which you can see all at once). Based on the crowds at the beginning and end of the Ko parade and at the end of the Lien parade as well as watching both march past me, I’m guessing the Lien event may have had as many as 50,000 people take part in some part of the day’s activities, and the Ko parade may have had 75,000. Remember, I’m a killjoy, and my numbers are always lower than everyone else’s. Also remember, that’s still a hell of a lot of people and a very successful political event. 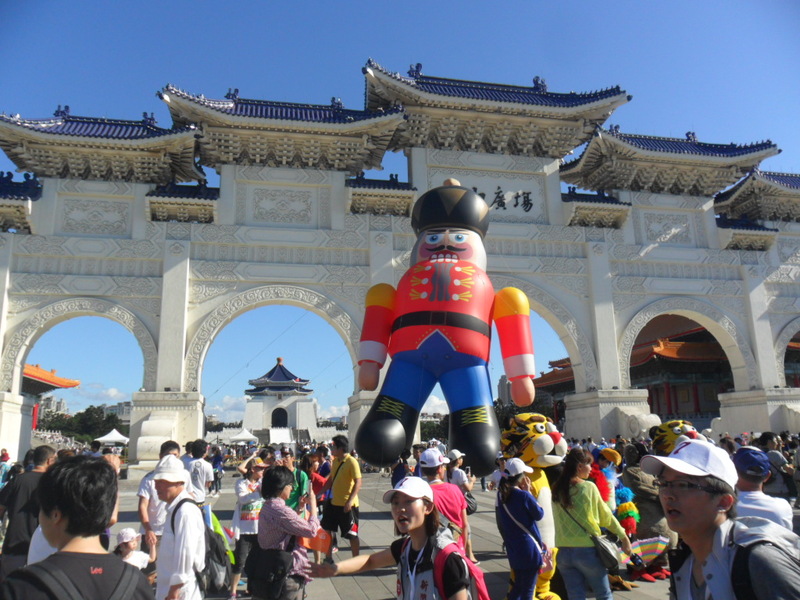 The nutcracker and a tiger stand in front of the main gate, with the CKS Temple looming in the background. Why the nutcracker and a tiger? Surely you can come up with something more unexpected than that. Yes, yes. Mary, Joseph, and baby Jesus. Now that makes perfect sense. Edit: A commenter points out that this is actually Mother Teresa and George Mackay. I thought it looked like Mother Teresa, but I was confused by the baby. Also, I confess I have no idea what George Mackay looked like. 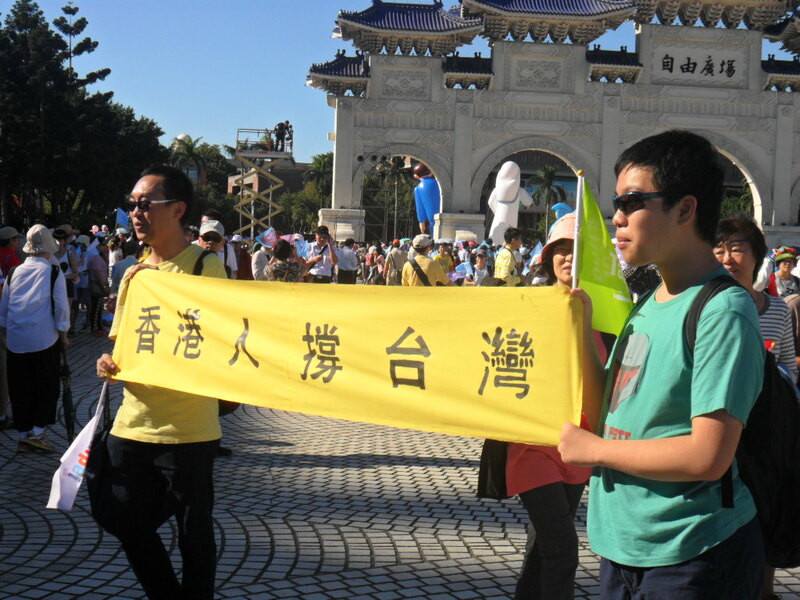 Hong Kongers support Taiwan. I saw a few yellow umbrellas and other references to Hong Kong. Taiwanese are not Chinese. One side, one country. There wasn’t any official platform from the campaign. Everyone brought their own appeals. 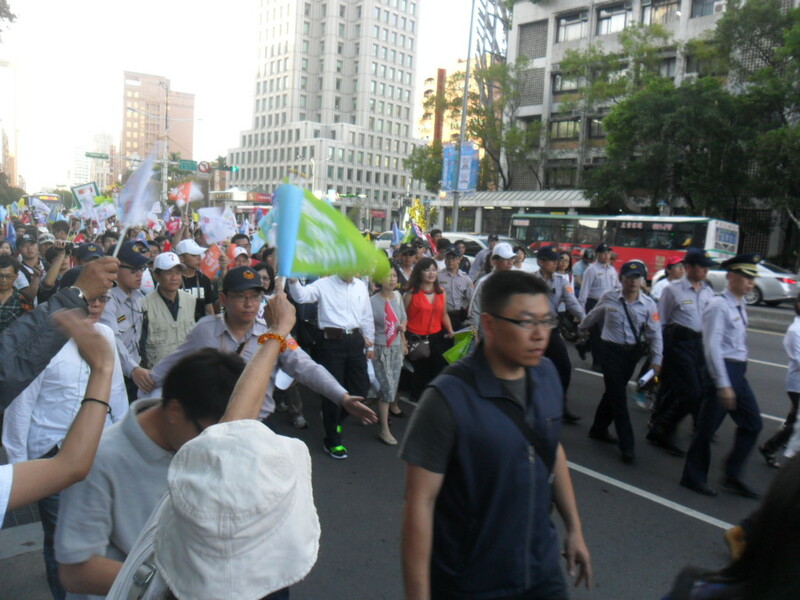 Some people marched carrying ROC flags. This group is from the independence wing of the political spectrum, but they were by no means the dominant voice. 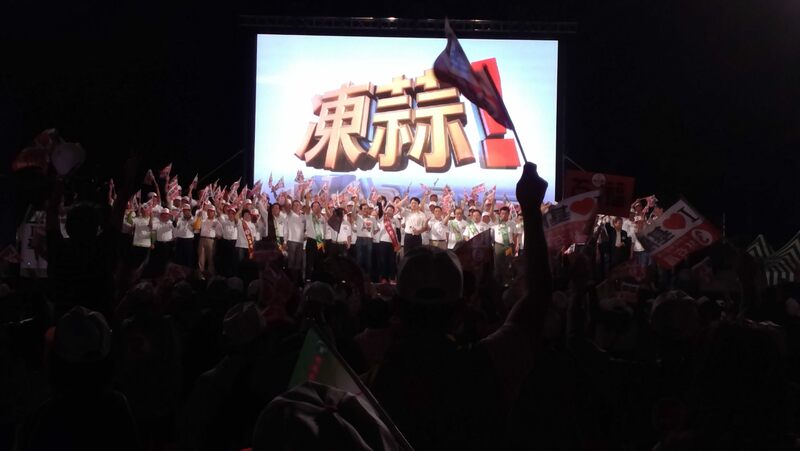 There was probably less hard-core Taiwanese nationalism today than there was hard-core Chinese nationalism at yesterday’s Lien parade. 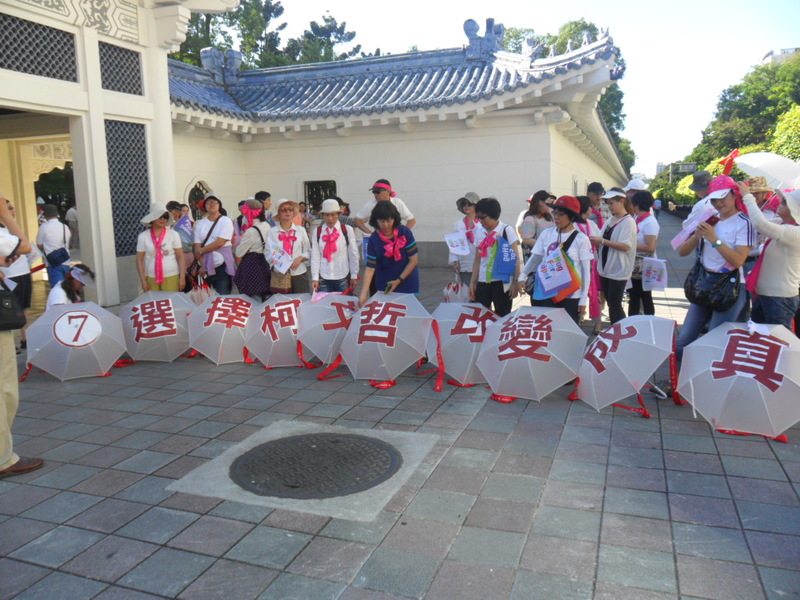 The Ko ladies group gets their parasols ready for the parade. The Lien campaign is making quite an issue of Ko’s attitudes toward women, so it is very helpful for Ko to have a visible and prominent women’s group supporting him. I love this photo. 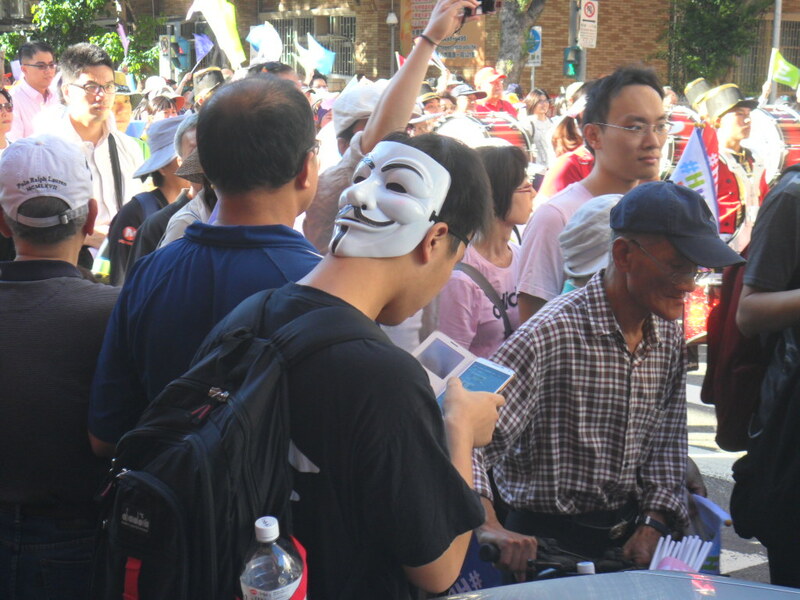 The kid is wearing a Guy Fawkes mask, but he doesn’t really need to be anonymous today, so it’s on the back of his head. The I-Pad is more interesting than the revolution today. Still, the Sunflowers have had a strong influence on the Ko campaign, and there were a lot of young people at today’s parade. 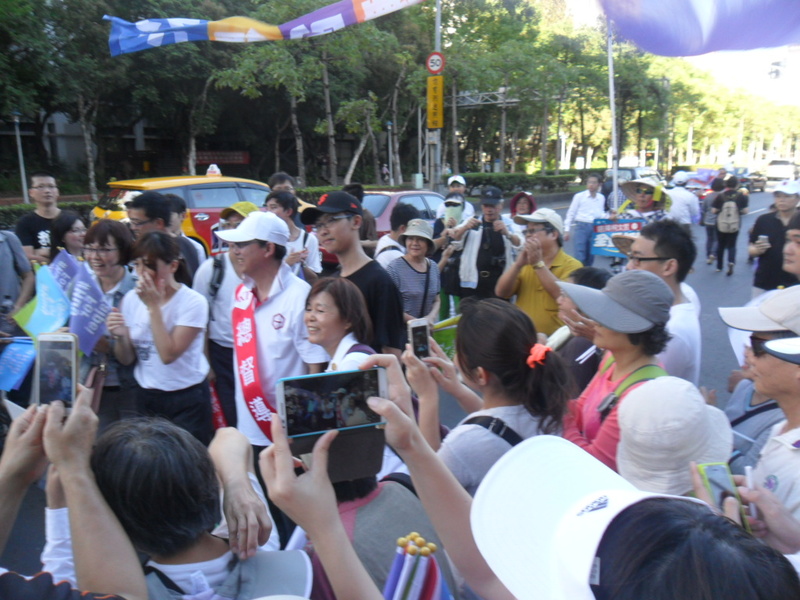 Ko’s campaign manager, Yao Wen-chih, stopped for a few minutes right in front of us. Everyone wanted to take a picture with him. 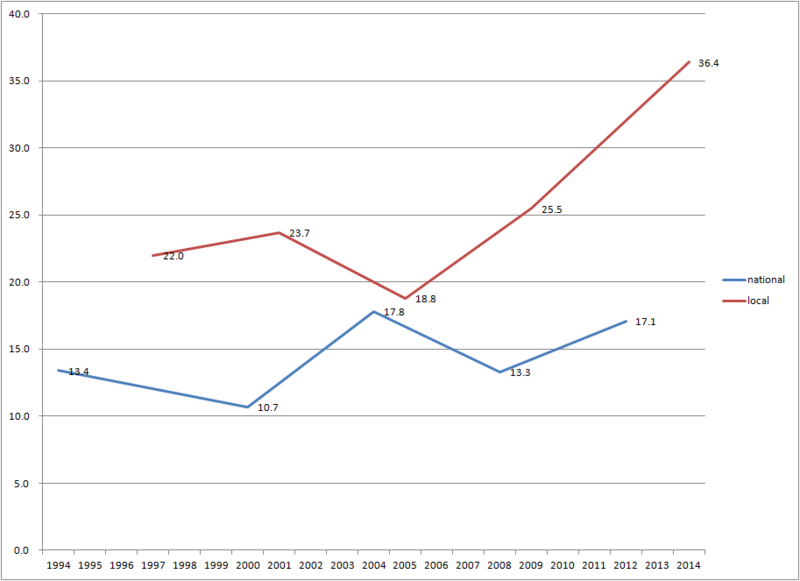 This is just about as close to being a rock star as a political scientist can ever get. Edit: Commenter pohao points out that this is Yao Li-ming 姚立明, not Yao Wen-chih 姚文智. Oops. Thanks for the correction. Every parade needs a marching band or five. This one only had one, but at least they had a color guard to go along with it. 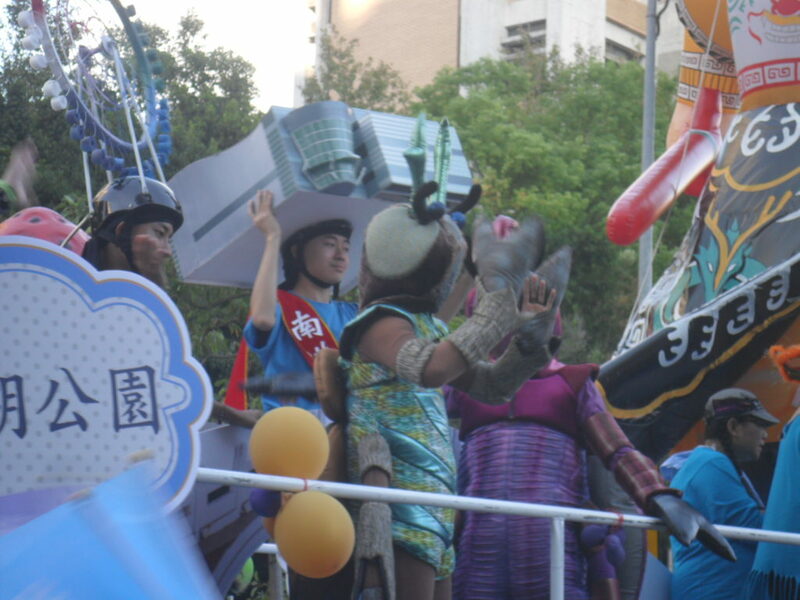 After Mary, Joseph, and the nutcracker, here’s a more conventional dragon float. 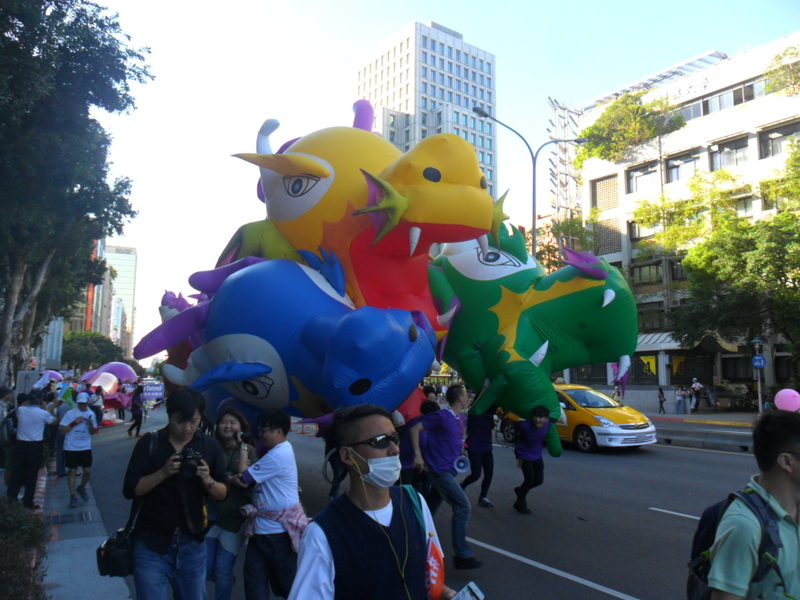 I took a lot of pictures of balloons, people dressed in costumes, signs and so on because they are colorful. 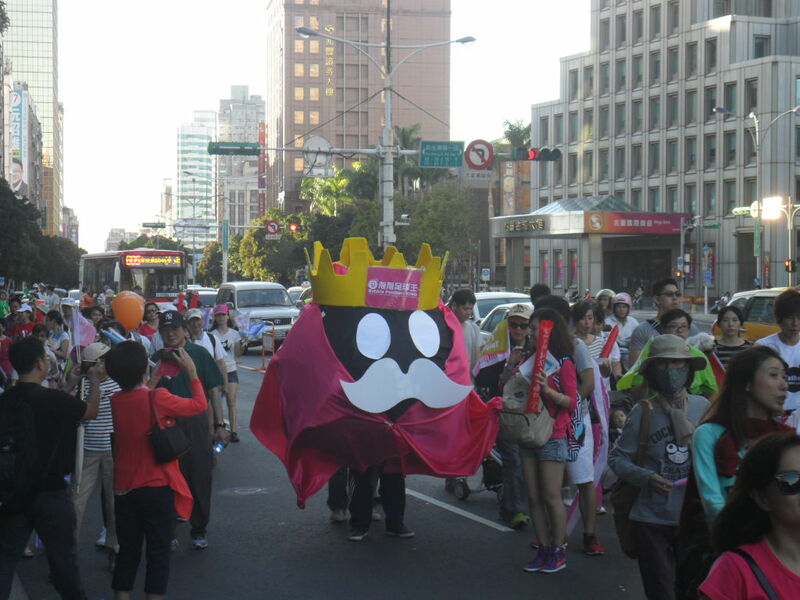 However, most of the marchers were just normal people happily joining along. Above, I said that the Ko campaign didn’t really have a slogan or a theme. That’s not quite true. 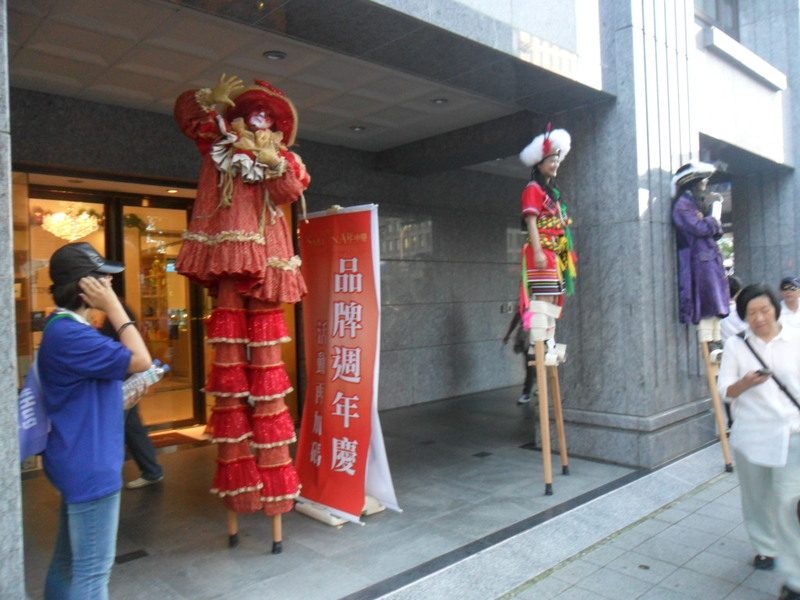 The main theme was inclusiveness. This was symbolized in part by their many colors of flags. 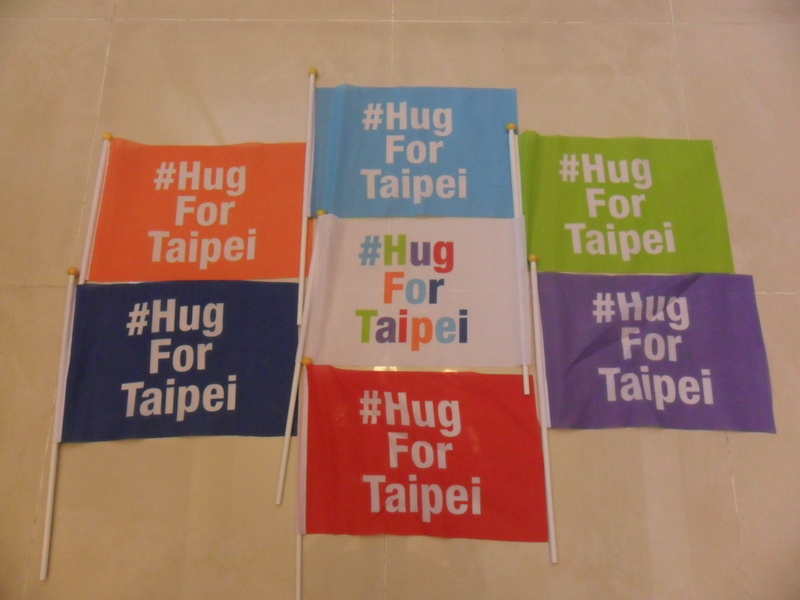 They had eight differently colored flags with identical messages (#hugforTaipei). 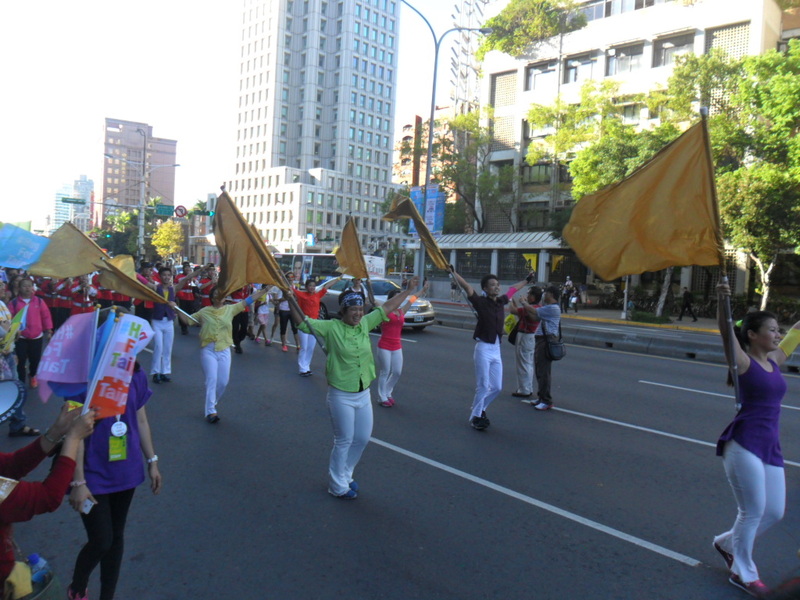 Many people collected one of each and marched with a rainbow of colored flags in their hands. 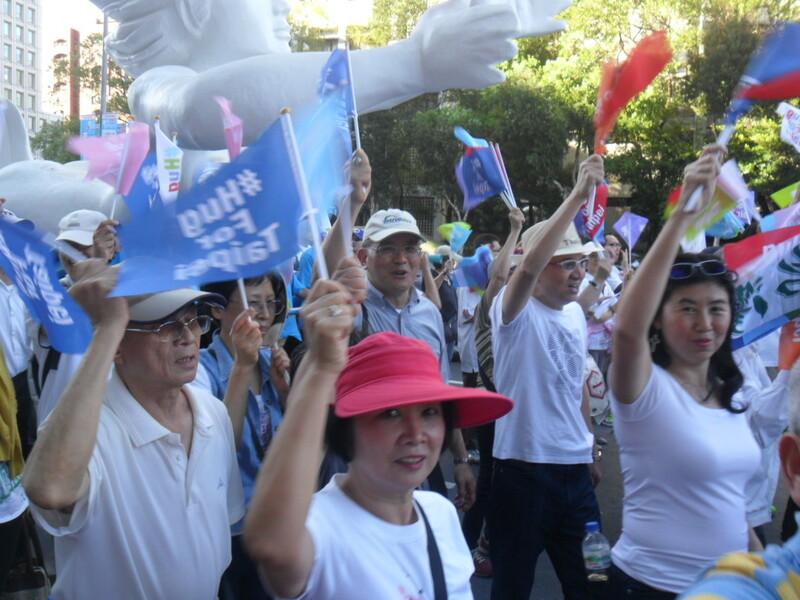 These people are marching with blue flags — that’s the KMT’s color! The political scientist in me is a little disconcerted by this emphasis on unity. Unity and harmony are often the slogans of dictators. Democracy requires a bit of division to work. 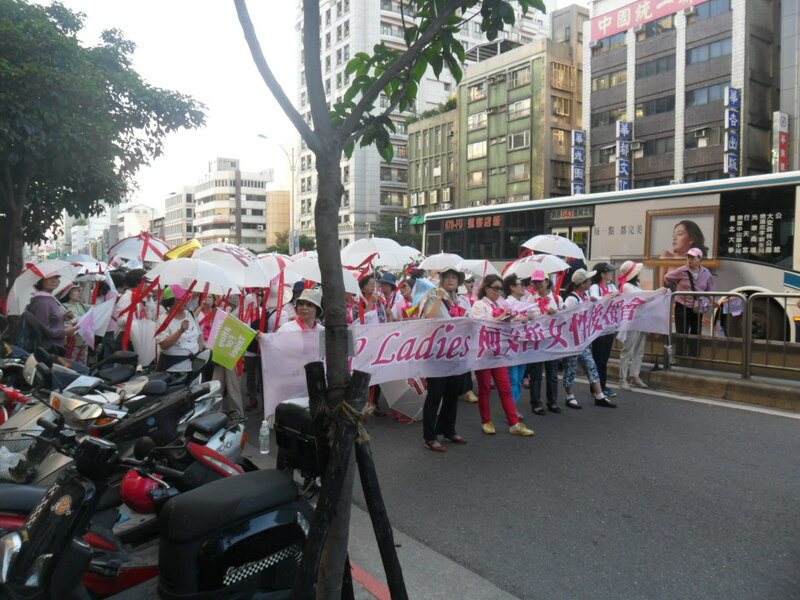 I suppose we in Taiwan are not really in any danger of not enough division though. 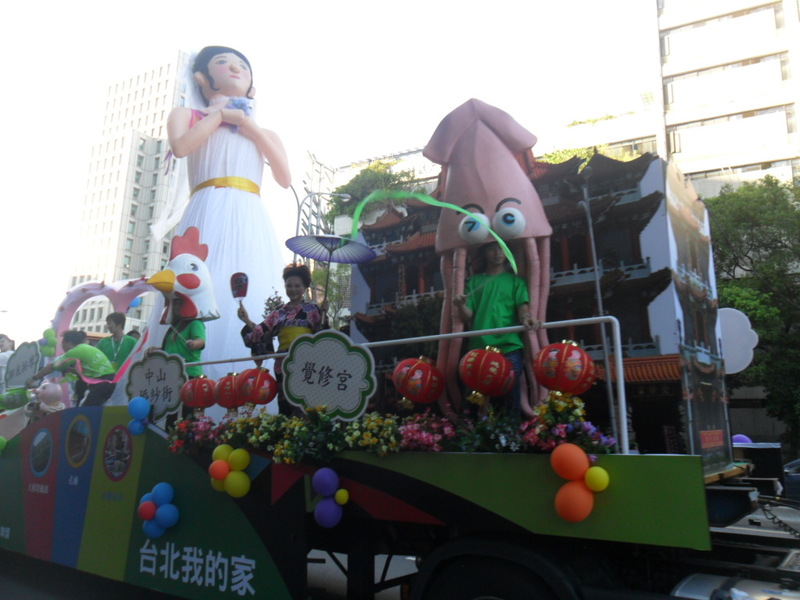 A blow-up god rides on a flatbed truck. 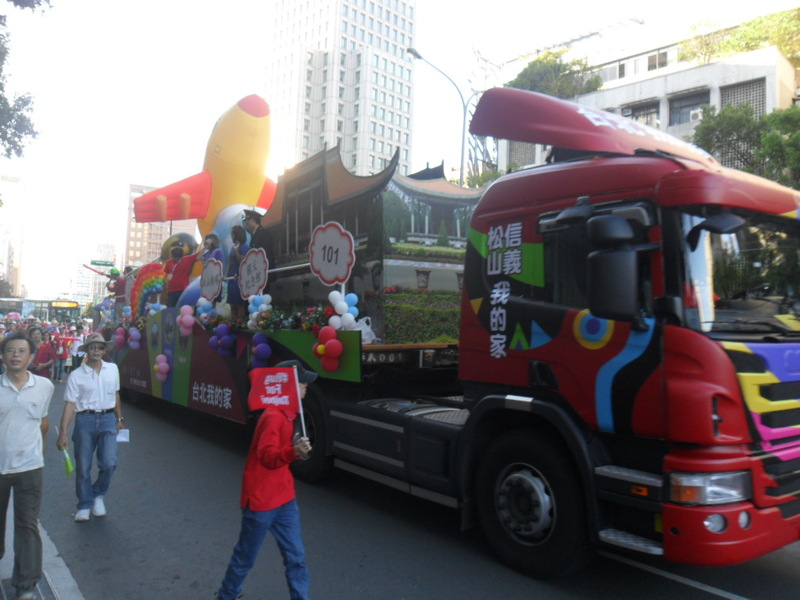 The campaign had eight of these trucks, one for each of the color groups. Each group represented both a geographical area of the city and a theme, such as youth or creativity. 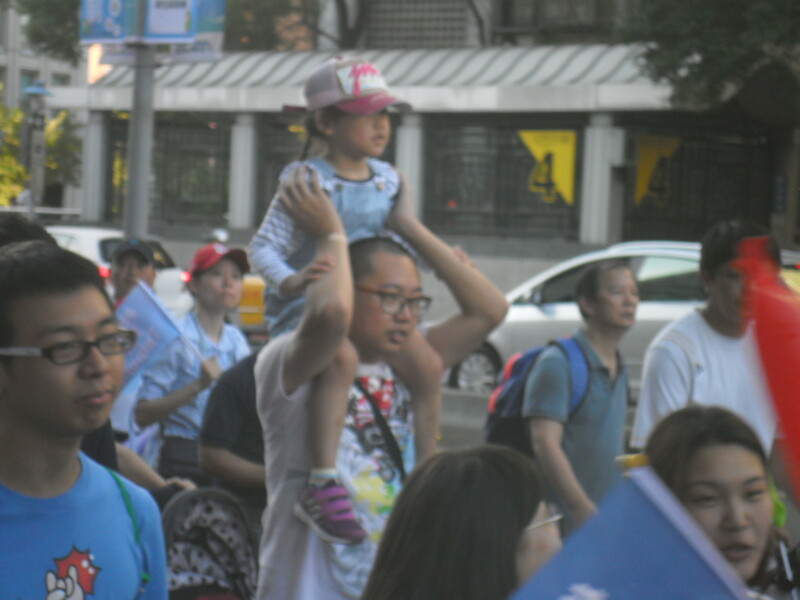 Here on the Nangang District truck, someone wears the Nangang Exhibition Center on his head. The view is better from up here. A lot of signs were professionally printed, but a surprisingly large number were handmade. 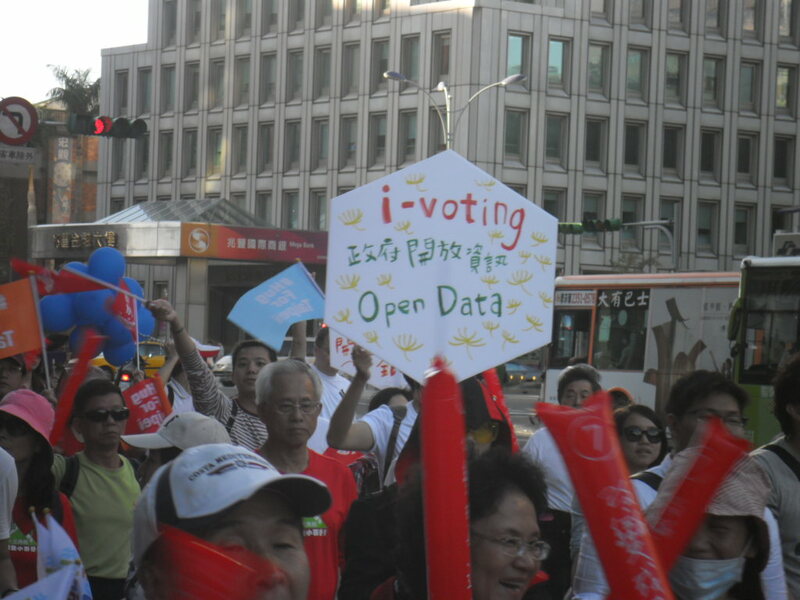 Ko’s campaign is committed to the idea of i-voting. This may come from the Sunflower influence and the idea that the internet can coordinate preferences. It may also come from the Ko campaign’s commitment to bottom-up politics. Probably both. Personally (and professionally), I think internet voting is a terrible idea and I hope it doesn’t catch on. Maybe someone should have told the artists that the Songshan Airport is not in Songshan District. The Sun Yat-sen Memorial is appropriate, though. The Bubble Soccer King. The Lien campaign actually took issue with this character yesterday. 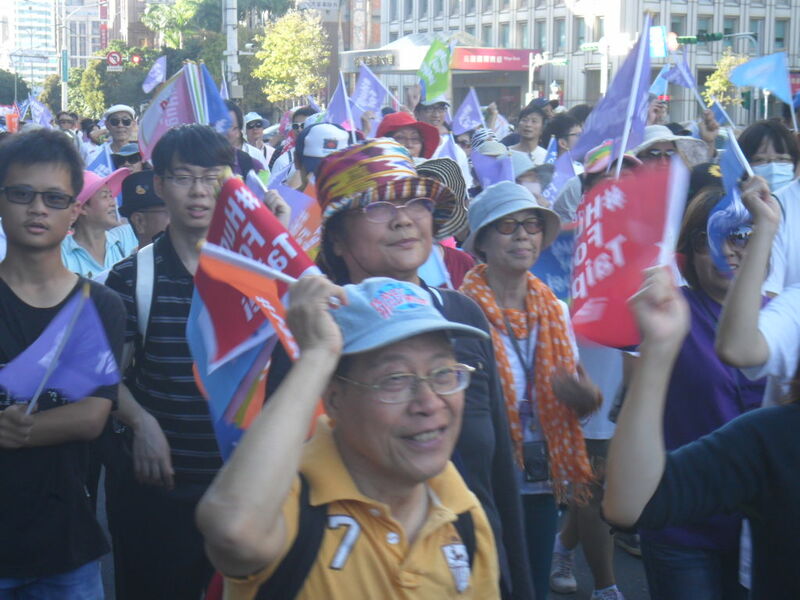 One speaker complained that the Ko campaign was diverted with superficial things like bubble soccer while the China-Korea FTA threatened to marginalize (ie: bubbleize) Taiwan’s economy. 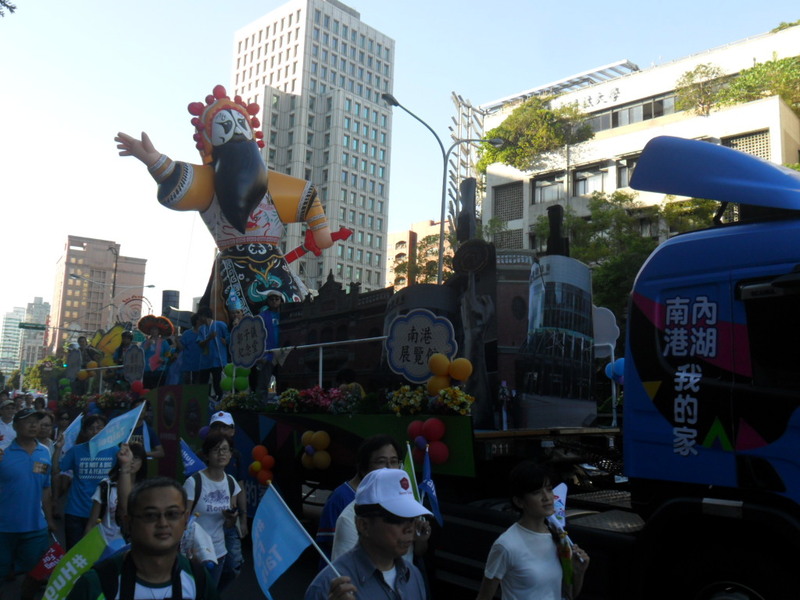 This float celebrates all the wedding photography studios in Zhongshan District. Mrs. Garlic thought that the bride looked a bit like a transvestite and wondered if the Ko campaign was openly supporting gay marriage. She was so disappointed when I told her I thought the bride looked like a woman. Marchers waving a city council candidate’s flag. I was shocked at how few city council candidates were there. They must have been asked to stay away, perhaps to maintain the idea that the Ko campaign is not simply an extension of the DPP. Well of course the doctors support Ko P. Or at least the people pretending to be doctors. This was my favorite float. 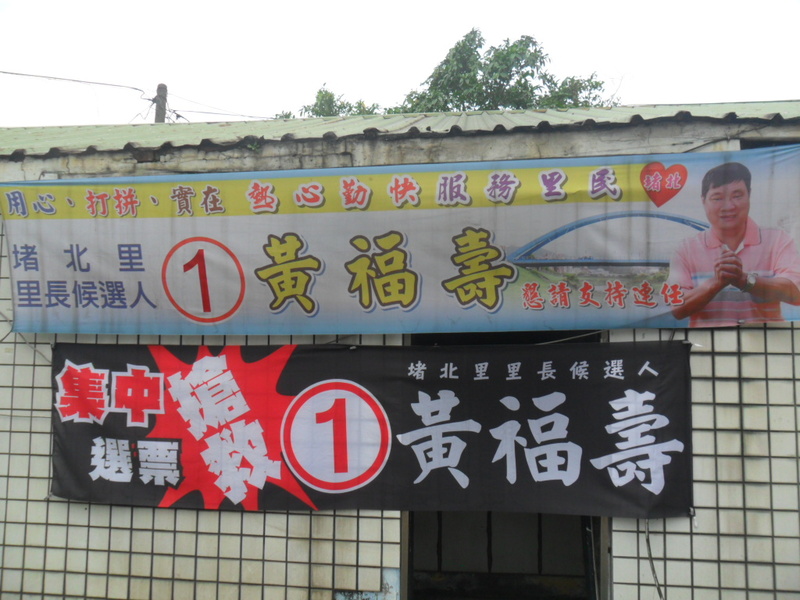 In Wanhua District, one of the first centers of the Tangwai movement, a fake candidate asks for votes. Frozen Garlic! 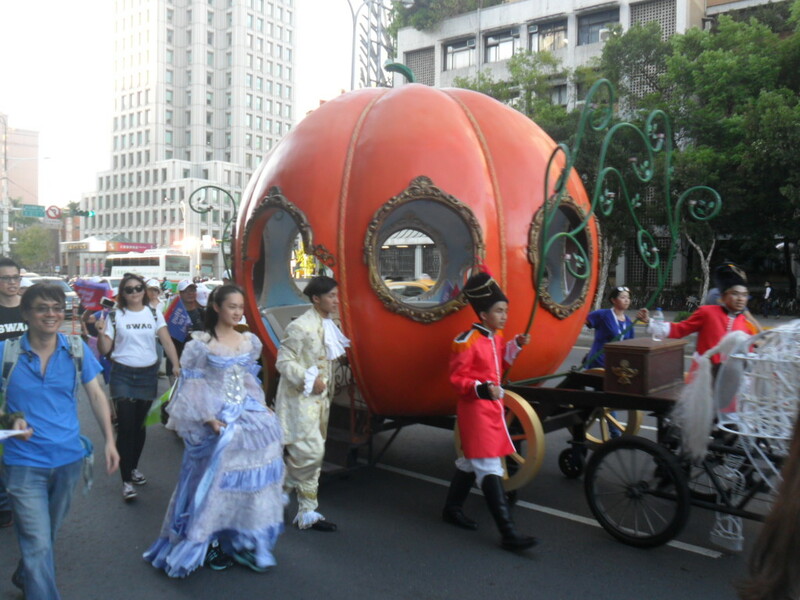 Cinderella and her prince walk next to the pumpkin carriage. What happens when the clock strikes midnight? Or 4:00pm on the 29th? 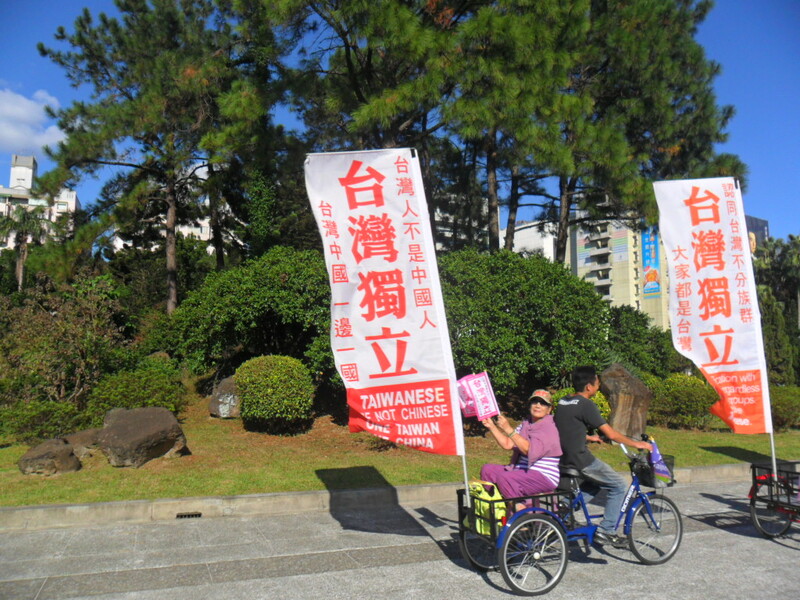 A TSU candidate’s supporters march. 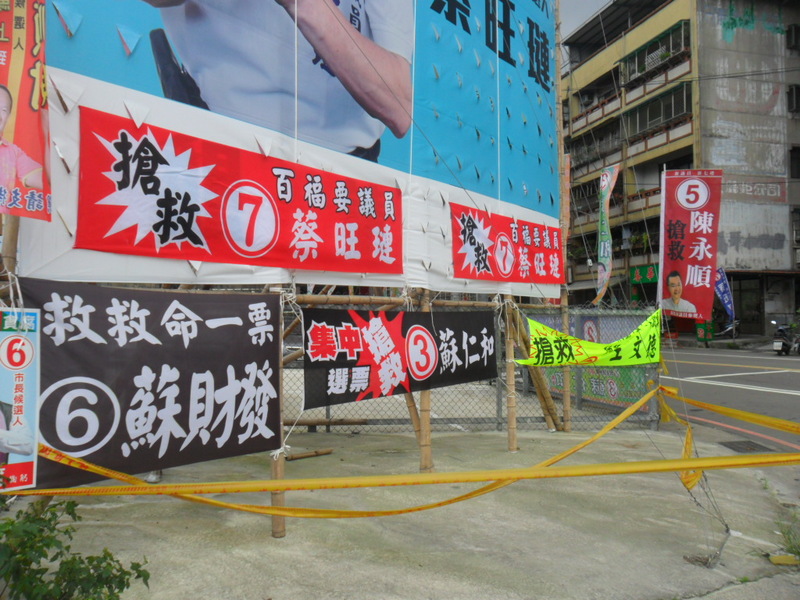 The sign on the left says, “a vote for Sean Lien is a vote for the communist party.” Wow, they completely skipped over President Ma. He must feel really unimportant. Six kilometers is a long way to walk on stilts. Maybe it’s time for a rest. Everyone wanted to take a picture with the girl in Aboriginal dress. Ko marched almost at the end of the parade. This is great picture of Ko except for the minor problem of the green flag where his face should be. I warned you I’m a lousy photographer. We’re going to win! One City, One Family! 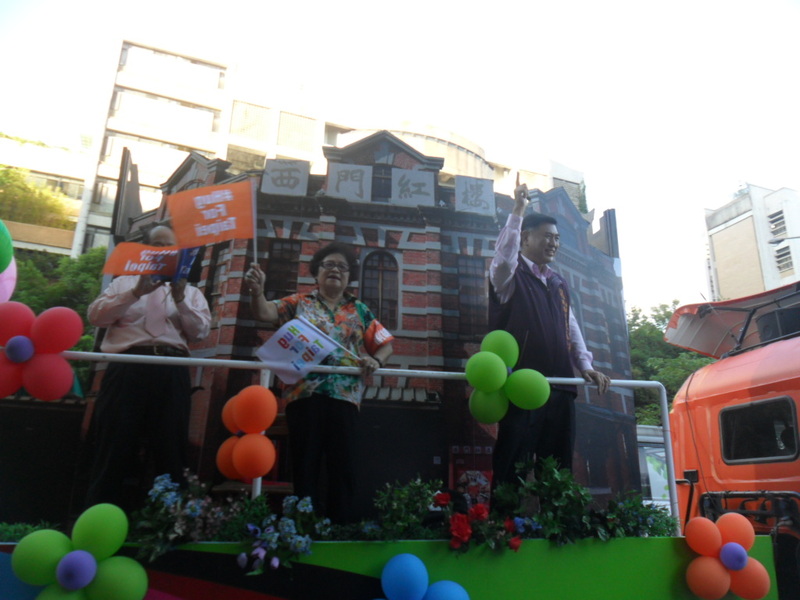 After the Lien parade and rally finished, I drove to Keelung City to watch a rally for DPP mayoral candidate Lin You-chang 林右昌. This was a much different, much happier atmosphere. The crowd was about half the size of Lien’s rally. I estimate there were about 6000 people here. Remember, my estimates are always lower than everyone else’s. I try not to inflate numbers just to make people feel good. That said, 6000 is a lot of people in a small city. You will observe that everyone is wearing an identical white hat. This is usually a sure sign that the crowd was mobilized. In this case, however, they were handing out white caps to everyone, even me. There were a lot of buses, but there were also a ton of scooters and the adjacent parking lot was full of private cars. 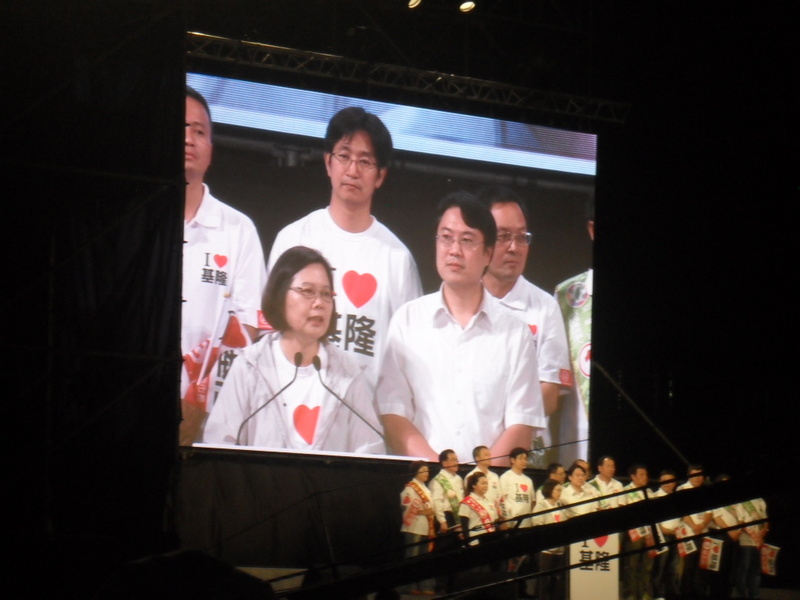 Tsai Ing-wen was speaking as I arrived. She’s getting better, but she’s never going to be a rousing orator. It’s amazing how every time I see her, the crowd goes crazy for her introduction, sits patiently through one of her patented lectures, and then goes crazy for her again after she finishes. Fun rallies are great, but even us thrill-seekers understand that a clear political vision is more important (and the “Amens!” can always wait for the next speaker). The sermon is over, it’s time for hallelujahs! Lin gives his speech. Note that his color is red, not green. 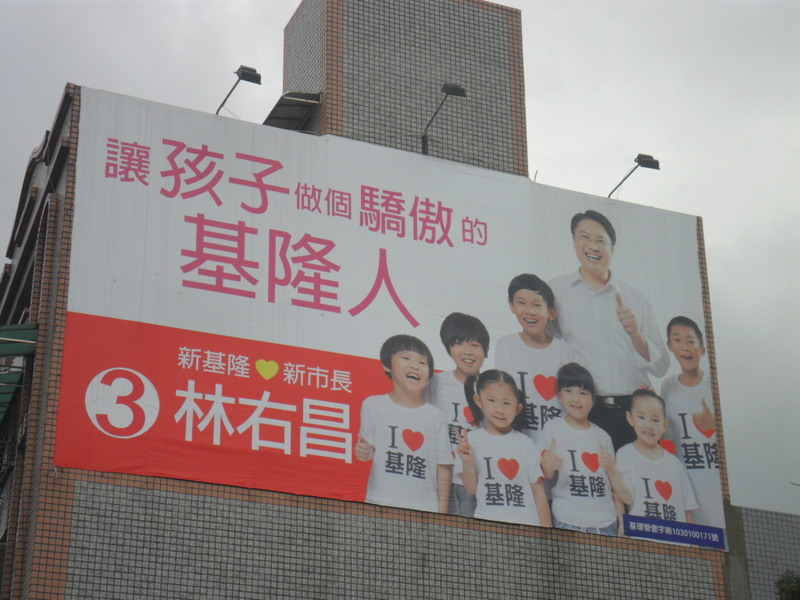 Lin is making the same sort of cross-party appeals in Keelung that Ko is making in Taipei. 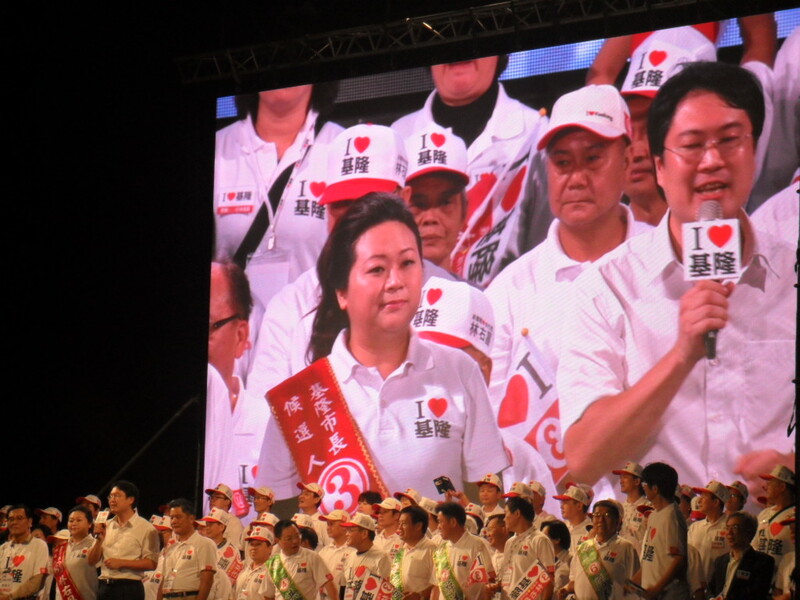 Before he spoke, they had a 93 year old military veteran with a thick Shandong accent come up to endorse Lin. 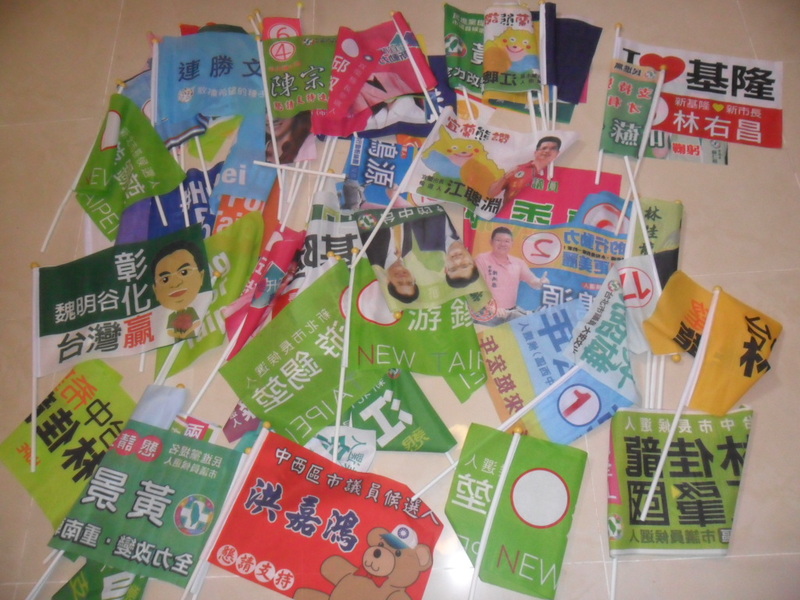 Of course, in both Taipei and Keelung, these efforts are driven mostly by the fact that there are not enough green voters to win a majority. They have to reach out to people who don’t already support them. 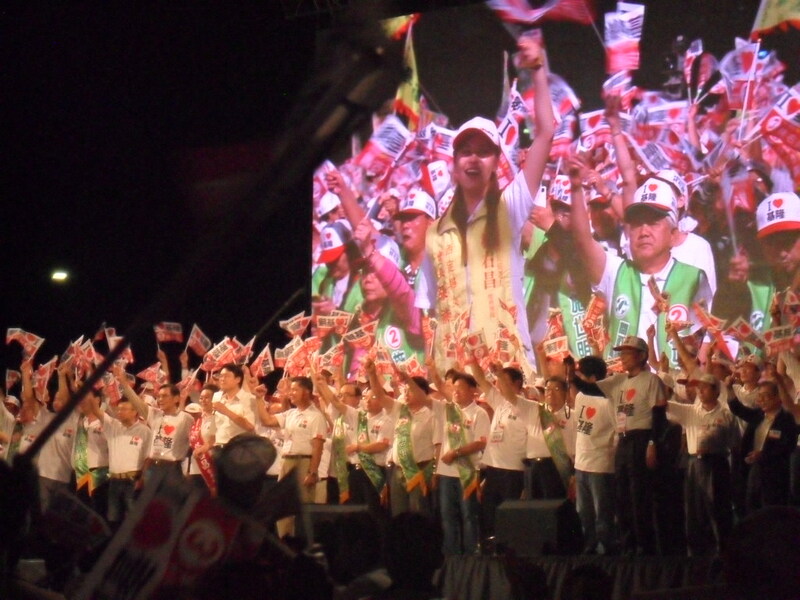 The entire population of Keelung City crowds onto the stage to support Lin’s candidacy. I think this might have to be the official photo of my blog. Frozen Garlic! You are currently browsing the Frozen Garlic blog archives for November, 2014.